Then again found... felt and lost! The narrative flows with ease. If the first half is full of vibrant colors, the colors in the second half gradually fade, befitting the mood that the movie carries. As the movie progresses, the characters also evolve; from simple innocent characters to the complex persons carrying shades of grey and at times daringly adorning black! The show-stealer is none other than the star himself – Dhanush. I went to watch the movie for him and as always, he didn’t disappoint me. His impulsive reactions, natural acting, mannerisms and effortless dialog delivery steals our heart. His tears are so believable, his smile is filled with childlike innocence and he leaves us in awe. And I fell in love with him all over again. There was nothing challenging as far as the role he enacted is concerned. He has done all this and so much more in Tamil movies. Yet he doesn’t fail to bewitch us. And that’s where he scores high. He gave another reason to raise my collar high and call myself a “Dhanush fan”. Wondering what he can’t do... He proved that acting is an art and goes far beyond language and geographical barriers! Sonam Kapoor looks a-w-e-s-o-m-e!!! She looks simple and beautiful beyond words. She has done a fair job. Yet she does struggle to match the level that Dhanush set. The character she portrays is very strong and bold and at times; but her expressions don’t blend with the circumstances. Yet a long way from “Saawariya” and “I hate love stories” days I would say! And I loved those two capable artists who had enacted the part of Murari and Bindya. They stay in our heart. They are so relatable and real. They are spontaneous and witty at the same time! From Socha na tha days, I have a problem in liking Abhay Deol. He looks the same in every movie and his acting also seems to be the same regardless of the characterization. And here also same story! He comes... acts and goes... And I was left with the same feeling... The feeling of indifference because I neither like him nor hate him! As far as the songs are concerned, I liked only “Tum Tak”. The rest are average. But the background music blends with the flavor and mood of the movie. 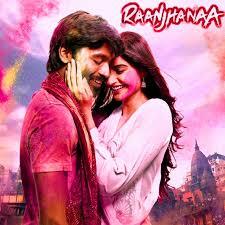 And I believe that Raanjhanaa would be the first musical average in Dhanush’s career. After all, all the songs from Thulluvatho illamai days have been a musical extravaganza. The plot is it is intriguing, carrying an aura of enigma. There are lots of twists and turns. There are many unexpected events that unravel. And at the climax would certainly astound you. Further, if you are an ardent Dhanush fan (like me), an uneasy feeling will creep within you. And that would make you wonder if you liked the movie because you would be dissolved in the character called Kundan that you would be reluctant to think and look beyond him!